If Mike Barry were living in this country he'd be a household name, at least among cyclers who've been around a few years. But he's an Englishman living in Ontario (the Canadian one), where he is well-known because he's been plying his trade there for more than 30 years. I've known of him for maybe 10 years, and I've spoken to him on a semi-regular basis often since Rivendell began, and I know more now because of it. His passion is for what we around here call "Frenchy bikes," but he knows old bikes and new bikes, cheap bikes and good ones, and has at times been a racer, randonneur; advocate, designer, builder; and retailer. Mike's overall bicycle knowledge, past and present, is undoubtedly unsurpassed, and certain aspects of it are unequalled. I've tried to draw that out in this interview, and in some cases I am slightly insincerely argumentative, to that end. Grant Peterson: Where and when did you grow up, what were you like (and what did you like) as a kid? Mike Barry:I was born just before the war (1938), and grew up in Wimbledon, South London, England. My Father died when I was six months old, so I never knew him. I had no brothers or sisters. GP: When did you start to ride a bike? MB: I learned to ride a bike at the age of about six, but there was a great shortage of bikes during and after the war. So my earliest rides, out into the Surrey countryside, were on my mother's single-gear BSA. GP: Was your mom short, or were you tall, or was the bike too big for you? MB: It was much too big for me, but I did several rides of thirty to forty miles at an age of about nine. When I was eleven, my mother bought me a Raleigh Lenton Sports, an all-steel sports bike with a Sturmey four-speed hub gear. I thought I was the bee's knees. Raleigh Pro Reg Harris was World Sprint Champion then and he was my hero. He had a Lenton Sports as his road training bike (at least that is what the advertisements said). What could have been better? I immediately became hooked on cycling, and devoured both of the weekly cycling magazines of the day. Cycling and The Bicycle. I've read Cycling every week since. That is 52 years. GP: Cycling has been a weekly for 52 years? MB: Yes, It was first published in 1891, and has been published every week since. Over the years, I have collected back issues, and now have about 86% of all the issues ever published. Most are in bound volumes. They make quite a good library of cycling history. GP: I bet. What was it like, riding in England back then, just after WWII? MB: It was a wonderful time to be cycling in England. There was very little traffic, and I soon got to know my way around the maze of country lanes just south of London. Herne Hill track wasn't far from home, and I often went there to watch Harris and the other sprinters of the day. The stands would be packed with thousands of spectators, who mostly arrived by bike. The bike parking area was filled with bikes, with barely a lock to be seen. Hundreds of bikes just leaning against one another. At the end of the meeting we would all race one another home emulating our heroes that we had seen performing on the track. 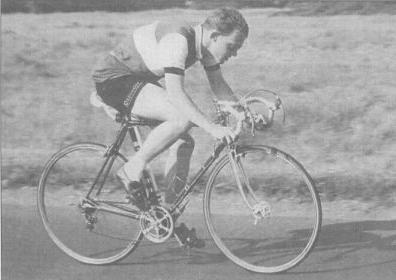 Riding a time trial in England in 1956. GP: Were bikes affordable, and what did you ride? MB: They were affordable, yes. because after the war there were many bomb sites around London, and they became places to deposit junk. We kids scoured them for old bike parts and put together a fair number of bikes that way. I'd sell these bikes, and use the money to buy new parts for my Lento Sports. It was not long before the Lenton frame wasn't good enough. I saved all my paper round money to buy a Claude Butler New Allrounder. Now I had really arrived. All of my spare time was spent cycling or hanging aroun the local bike shop. The manager was a club cyclist, and I didn't need much encouragement to start riding with the Redmon Cycling Club. I was about fourteen, but the club did not allow members below the age of sixteen. This didn't stop me riding with them, but because I wasn't a member a club, I couldn't race. At fifteen, I upped my age a year and became a member. My first race was a local classic, the Kentish Wheelers Novices 25-mile time trial. I won it with record time of 1 h 2m 40s. This delighted the older members of the club but I got a real telling-off for falsifying the membership form. It was believed in those days that young riders would burn out if they started racing before the age of sixteen. They'd take us on 150-mile tear-ups on Sunday and think nothing of it, but for some reason thought a 25-mile time trial would burn us out. After that, I raced regularly, and did reasonably well as a first category amateur. Compulsory National Service got me into the RAF for three years, where I managed to get onto the RAF Cycling Team. This was wonderful, because there were inter-service races all over the country on Wednesdays and civilian events on Sundays. Most of the time that I was supposed to be fixing planes, I was riding my bike or traveling to and from events. GP: When did you move to Canada? MB: Besides spending my time in the RAF racing bikes, I did manage to get a pretty good education in electronics. After I was discharged I got a job servicing and installing spectrometers. These are analytical instruments used primarily in the metals and oil industries. The job enabled me to travel a fair bit, and that whetted my appetite to see a bit more of the world. I moved to Canada in 1964 with the idea of staying for a year or so and then moving on to Australia. Bike racing in Canada at that time was great, as there were thousands of recent immigrants from Europe and all the races were like international events. Each ethnic group had their own club. I became a member of the Britannia CC, which was all Brits. There was an Italia CC, a Croatia CC, a Berolina CC (German), and so on. The cycling community was very close-knit, and each weekend after the race there was always a party somewhere, It was a great time. However, early in 1965, I was offered a job by a U.S. company that made spectrometers and I moved first to Detroit, and then to Pittsburgh, and later to Buffalo, New York. There was very little cycling in the U.S. at that time, but my job took me all over the country. I would always look up the local cycling club in any town I was in. That way I made cycling friends in many towns. Although there were few cyclists, they were real enthusiasts. One had to be enthusiastic to put up with the ridicule one received. No one that I worked with would believe that someone my age (27) who had a company car would actually choose to ride a bicycle in their spare time. There was a very keen bike racing community in Buffalo, and many National Champions and Olympic riders came from there. GP: When did you start to build frames, and how did that come about? MB: I moved back to Canada in 1968, and soon after met an old racing acquaintance from England, John Palmer. Back in England, we had both hung around bike shops in our youth and picked up a bit of knowledge of frame building, so this time around we struck up a close friendship. John was keen to start building frames in Toronto, and even had a set of 531 under his bed. I found out that CCM, the large Canadian bicycle manufacturer, had recently sold off all their lightweight frame-building components. I managed to track them down and bought the lot for $100.00. There were several complete sets of 531, and numerous sets of Nervex Pro and Legere lugs. Only true fanatics could understand the excitement with which John and I pored over those dusty, dirty old boxes of bits of steel. We then rented a friend's basement, got ourselves some torches and gas tanks, and were under way. We spent many hours in that basement. The first frames we built were used in the indoor velodrome in Delhi Ontario. They were well received and seemed to stand up well to the rough and tumble of steeply banked velodrome racing. The Delhi track was 115 metres and had 55-degree bankings. Those basement hours, one would have thought, would have had a detrimental effect on our love lives, but in fact both our future wives spent many hours down there with us. There's true love for you. GP: What do you look at when you look at a bike frame? What matters to you, aesthetically? MB: If just the frame, then it is the workmanship. Clean brazing. Lugs, of course, although I do like well-made bronze welded bikes. You probably call them "fillet brazed." Paint and finishing detail is very important. I really dislike unicrown forks, Aheadsets, silly nonsense like curved seat stays, and other gimmicky things which make no difference to the ride and do not help the aesthetics. GP: How would you describe the change in bicycles from the '40s to now? Say, decade by decade. Talk about anything from how they were marketed and advertised, to styles, popularity, materials.. anything. MB: Actually I think it quite surprising how little change there has been, By the end of the forties we had 5 cogs on the back and two or three chainwheels. The Italians and French had well designed frames but their workmanship wasn't up to the standard of the Brits. The Brits did very nice workmanship but their design was generally poor. It was the fashion in England in the '40s to have 73-degree head and 71-degree seat no matter what size frame. MB: Yes, it possibly does work well for you on a 59cm frame but to say that 73/71 was ideal for all frame sizes is ridiculous; but that is what they did in those days. In the fifties they went to "Continental" styling which meant 72 degrees parallel no matter what size frame. That, of course, meant super long top tubes on small frames or toe clip overlap. The latter was often a big problem with Brit bikes, especially as they were all built for 27" wheels and mudguards. I've always liked the French touring and "around town" bikes and the Italian racing bikes. I've never seen a good Italian touring bike, although some of their "around town" bikes are excellent. Just after the war, late forties, early fifties, there was a lot of innovation in the bike industry. Lots of small companies making all sorts of interesting stuff. Palladini hubs (similar to the later Cinelli Bivalent hubs), Campag Paris-Roubaix derailleurs, Constrictor components from England, the whole incredible range of gears from Sturmey Archer, wonderful oil bath transmission from Sunbeam with a quick-release three-speed hub that left the sprocket and chain in the bike when the rear wheel was removed. It seems to me that in those days innovation and quality drove the market where as today it is driven by fashion. MB: I know you are not going to like this, but I believe that the biggest improvement in bikes in the last fifty years that I have been around them is derailleurs and shifters. There is no comparison between the old stuff and the new derailleurs with STI or Ergopower. We have the Japanese to thank for that. We would all still be riding campag Super Record if Shimano and SunTour hadn't made them change their ways. Don't get me wrong, there is a certain aesthetic and simple quality to the Super Record stuff but the cheapest Shimano now works much better. GP: I'm not the arbiter of taste, but although I think today's derailleurs are as functionally good as derailleurs have ever been, they lack the style of the old ones, and they don't work world's better than a top derailleur from the '80s. It's sort of like comparing a $399 3.4 megapixel digital camera from today with a Canon or Olympus or Rollei rangefinder from back then - which is better is hard to say until you define "better." No doubt today's shifting is faster and more convenient, but the difference In a non-racing situation, just a guy out on a lonely road needing to downshift for the climb or a tailwind-well, how hard is it, even with a "crummy" old Super Record? You ease up a hair on the pedals and pay a small bit of attention for a fraction of a second, and bingo, you're in. MB: Oh yes. It works quite well but with STI/ERGO one doesn't even think about it. changing gear just becomes a natural reaction. GP: Hmm.. well, yes, but from my observations and limited experience, it goes beyond "natural reaction" to the point where riders start shifting even when there's no need to. I think it's like a full guy walking around with a chunk of a cheeseburger in his mouth, and a Camelback full of a chocolate shake and the straw's in his mouth. Shifts occur because they're so easy, and they become almost reflexive, even when there's little or nothing to gain. I think a case can be made for maintaining reasonable convenience while removing irresistible temptation, and that's where downtube shifters and bar-ends come in; and I don't like the looks of the others, either. MB: I admit down-tube levers make for a much cleaner, aesthetically pleasing bike but I find it difficult to see that bar-end controls have any aesthetic or mechanical virtue over Ergopower. GP: Well, I suppose you can get used to something if you're exposed to it enough. But at this stage of my life I'd take a Shimano Tiagra aero lever over any integrated lever, because they look better to me and fit my hand better. Outside of competition and riders who for medical reasons can't move their hands around, I see STI and Ergo as a way to make bikes more attractive to those riders who associate "Integration" and "high tech" and "change" as improvements. They offer "brainless shifting," but shifting's already easy enough; and they turn riders into compulsive shifters. MB: I cannot see what is wrong with "brainless shifting." After all the bike is a tool for transporting oneself under one's own power with the least amount of effort. GP: It's hard to counter the "tool" argument, but another way to look at it is that it"s a whole world in itself, and reflects the values arid personality and attitude of its rider. If a bike is just a tool, then we all ride super-thin TIG-welded steel, powder-coated black, or maybe aluminum. In that world, your Mariposa bicycles, with their gorgeous integrated racks wouldn't exist. I'm not denyiny their function, but there are cheaper and faster ways to achieve it. For the racer the bike is just a tool, but to somebody who loves bicycles, I think it's more. MB: Well, sure, but there have always been beautifully made tools, and making a tool beautiful doesn't make it work any less efficiently, it just makes it more enjoyable to own and use. Just look at some of the wonderful wood planes tha have been produced. Cheaper, less well-finished tools often do an equally good job, but they are not so enjoyable to own and use. If you're really enthusiastic cycling or wood work whatever, you just get more enjoyment from having really nicely constructed equipment. I don't you should have to think about changing gears. If I'm climbing a hill out of the saddle, as I am every morning on my rides in the park, it is great to be able to change to a lower ratio without sitting down and taking my hand off the bars It took me a long time to accept the new shifters but now have them I would never go back. I won't say that I don't enjoy riding my vintage bikes with their down tube levers and I love riding my bikes equipped with the much more difficult Campag Paris-Roubaix shifters, but they are not my choice for everyday use. For the average rider I think it is the one new innovation that should not be ignored. 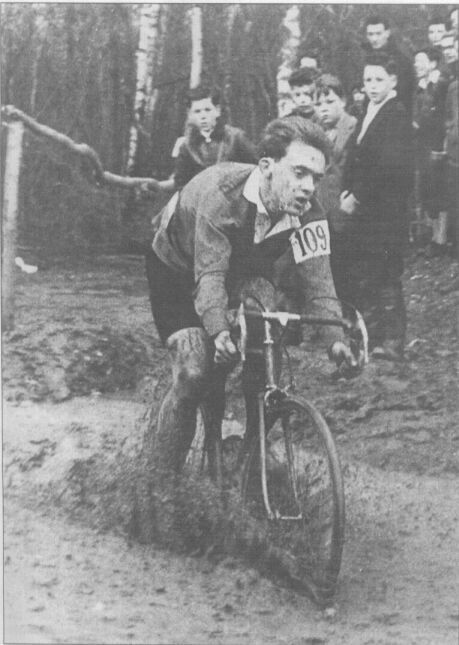 Racing the British Cyclo-cross Championships, 1958. GP: You have a point. But personally, I like feeling the derailleur move, and fine-tuning it. It's not a burden, and you miss that in indexing-all you feel is the click. But anyway, I wish manufacturers who have near monopolies, as Shimano and Campagnolo do, would also feel a responsibility to provide options. At one point I'd have said they have that responsibility, but I'm mellowing, and nowill just say I wish they felt one. MB: I certainly agree that there should be options. I also think manufacturers have a responsibility to supply spare parts for components made just three or four years ago.